You don't need to spend thousands to take your 4WD off-road. Just jump on in, but remember to look before you leap, writes MARK WILSON. Three days after heavy nor'west rains and Broken River still has a healthy flow. Slovens Stream is flowing into it from the left, which means there is likely to be a hole at the confluence. But running at 45 degrees from where we are to the opposite bank and just visible in the still silt-stained water is a way free of dips or large rocks. We hope. Because if there is one thing about four-wheel-driving never to get casual about, it's river crossings. You're only ever as good as your next one. I can still hear the words of one grizzled high country station owner after he gave me the OK to drive on his land - "And don't drown yer truck. I'm sick of grown men cryin' on my doorstep at 2 o'clock in the morning". It's about 10 metres to the other side and our lunch stop, the old Avoca Homestead, built in 1909 and restored by the Department of Conservation as a six-bed hut. To get here we turned off SH73, the road to Arthurs Pass, and headed down Craigieburn Road, following the Midland Railway. Above us looms one of the rail link's massive viaducts, the line immediately disappearing into a tunnel. 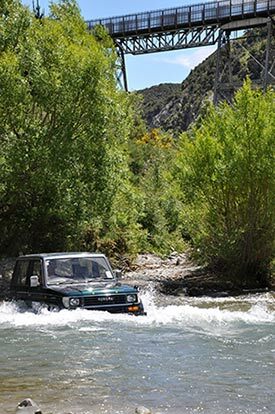 Crossing a high-country river is an essential part of the four-wheel-driving experience in Canterbury. 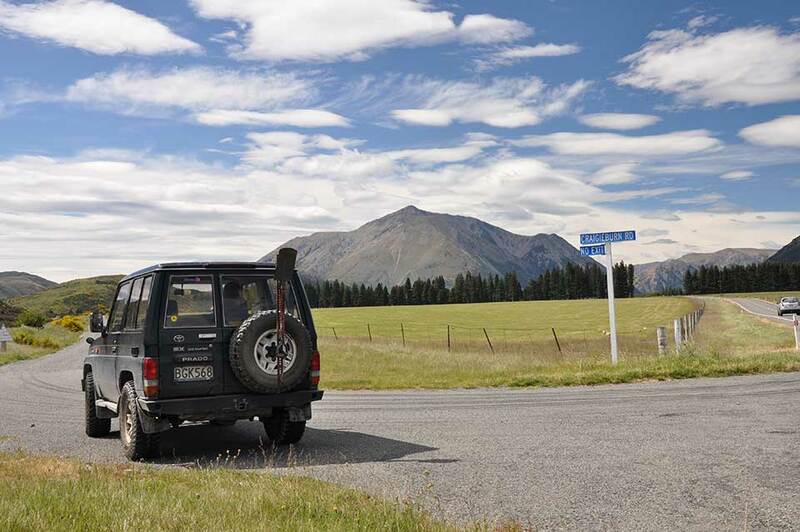 Other parts of the island attract off-road explorers because of their wild beaches and wilder tracks (West Coast), their bush and lakes (Nelson), mining relics and bleached tussocklands (Otago), and inland and coastal wilderness (Southland). And you don't need to spend thousands on winches and snorkels to get out and enjoy it either. Many of the routes in my guide book to the South Island can be safely tackled alone in a standard truck. What you will need is a good tow strap and tow hooks, a fire extinguisher, a decent first-aid kit, and a spade. If you still have a few hundred dollars to spend, buy yourself a wonderful device called a hi-lift jack. The thing is, the single most useful tool when you go off-road is another truck, to tow you out of trouble when you (inevitably) get stuck. And to carry the mates you want to enjoy it all with. A buddy's truck and the above short list of equipment is enough to get started. Twenty years of surveying 4WD routes and I still look for any excuse to go for a drive. So yesterday I checked over the truck and its gear, and re-checked the weather forecast. Easterlies, always the best for inland Canterbury and perfect for resurveying the route to Avoca Homestead. Son Harry is keen to drive, and I'm keen to photograph the views. I soon remember the peculiar charm of this route when we get to our first rail crossing and gate. For the next hour we criss-cross the Midland Railway, looking out for coal trains and leaving all the gates just as we found them. We drive in the shadow of the hills Og, Gog and Magog, the western flanks and jagged heights of the Torlesse Range ahead. Merino mums and their lambs keep us alert by dashing across the track just as we approach, and young cattle stomp the earth in youthful bravado before thinking better of it and moving aside. At one point broad swathes of pink and lavendar colour the landscape, courtesy of flowering lupins - beautiful to look at but an invasive weed in braided rivers. So far we have been getting along in high-range, the extra control of 4WD making life easier on the loose gravel surface. But we need the extra engine braking and crawling speed of low range for the steep, rutted climb from the rail embankment down into the gully of Slovens Stream, and certainly we need low range for our river crossing. So: windows up, engage low range second, identify the exit point - and drive in. Water splashes over the bonnet at first but soon we have a good bow wave ahead of us, directing the water away from the motor's precious air intake. We amble across, always ready to stop and reverse if we strike a rock or a hole. But our recce pays off - the way is clear of obstacles and soon we are on the far bank. We carry on to the homestead. Time for lunch.